About a year ago Vox ran an article on all of the science about Back Pain treatments, and it failed to mention Dr Sarno. This was a particularly egregious omission because the article was largely based on a book by Cathryn Ramin called “Crooked: Outwitting the Back Pain Industry and Getting on the Road to Recovery” which had a full chapter on Dr Sarno. The author of the article, Julia Belluz, was inundated with messages about the import of Dr Sarno, including one from myself, so she did a follow up article about him. The article begrudgingly acknowledged that much of what he talked about is slowly being embraced by the medical system but the title on the piece, “America’s most famous back pain doctor said pain is in your head. Thousands think he’s right”, frames him as a charlatan. She also refers to him as a “back pain guru”, which further discredits and dismisses him. In the new update addendum she first referred to him as a psychiatrist, despite the fact that he was a rehabilitation physician with 50 years of work at NYU medical center. She quickly corrected it when it was brought to her attention, but this “Freudian slip” reveals some of her thoughts about his standing as a doctor. It’s kind of interesting that she might make a Freudian slip given that she dismisses his work for being too rooted in this work. The article included some references to our film “All The Rage“, so I reached out to request that they correct the title because Dr Sarno never would have described the situation in this manner. They refused, arguing that it was “accurate”. They felt it was okay to state that he “said” this because they felt like this was what he “meant”. Writing about “science” can be tricky business. Technical writing can be boring and somewhat unconvincing. However, defending “science” with inflammatory clickbait headlines is fraught with a whole set of other problems. While I understand the writer’s desire to “defend” science, this kind of writing does a disservice to the stated goal of sober exploration of the facts. In doing so, it puts its thumb on the scale in such a way as to cloud the thoughtful observations, arguments, and concerns of people like Dr Sarno. The link to the original article goes to an updated version of this piece that appeared last week, prompting this new post. After the article about Dr Sarno first appeared last year, I wrote two pieces about the problematic nature of the title – and the article. The first, “How Frames Blind Us” deals directly with how the article frames Dr Sarno as a charlatan without fully examining what he had to say. Instead it paints him with a monochromatic brush that dismisses the complex, multi-system, approach he took in order to gain a greater understanding of what was going on in regards to pain syndromes. A few days later, after reading a series of comments about how ridiculous it was to give any credit to Dr Sarno at all I wrote a second post entitled, “Not Necessary to Negate” which was largely about how increasing specialization in medicine/science leads to islands of “truth” that ignore the ways in which complex systems interact. The revised back pain article which was republished last week now contains an addendum which acknowledges the omission of Dr Sarno but flatly states that “Back pain researchers and doctors generally still don’t find Sarno’s theories entirely convincing — particularly his one-size-fits-all diagnosis.” Her dismissal of Dr Sarno’s approach as one-size-fits all is based on the comments of another doctor who may not have been fully versed in Dr Sarno’s work. These paragraphs are from the article on Dr. Sarno. 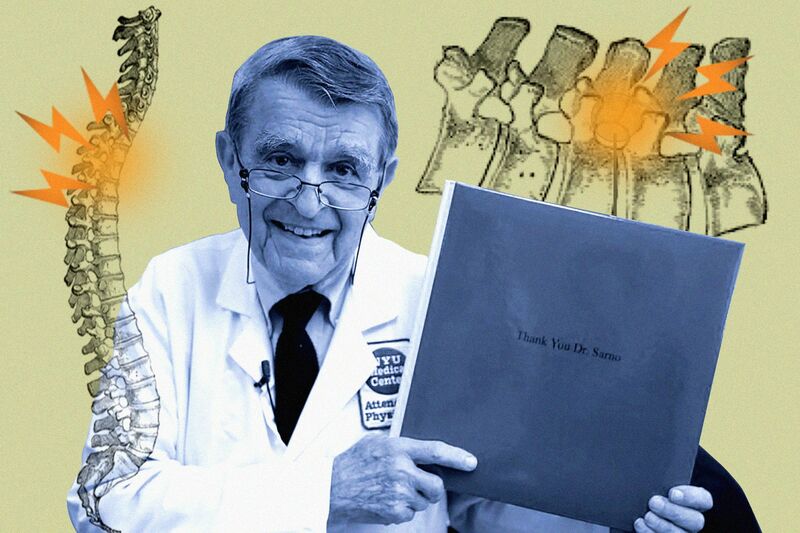 Back pain researchers and doctors generally didn’t find Sarno convincing — and many still don’t. Andrea Furlan, a psychiatrist who has published numerous systematic reviews on back pain, says the big problem with Sarno’s approach was that it was too “one-size-fits-all.” Some people’s back pain may be exacerbated by emotional problems or stress, but not everyone’s. “I think it is a mistake to generalize [the mind-body model] to all people with back pain,” Furlan said. Science has made it clear that mind body awareness has an effect on all “illness” and all pain. Dr Wayne Jonas, who worked both as a general practitioner and a researcher who did large surveys of blocks of studies to tease out the most relevant data for the VA and the NIH has come to the conclusion that 80% of healing comes from within, and only 20 percent from the “healing agent” provided by the medical community. Unsurprisingly, despite his credentials, and the show of support from colleagues, this groundbreaking work has largely gone unnoticed. What it illuminates is that 80% of healing is connected to emotional factors like belief, ritual, and community support. It is not a one-size-fits all approach. Instead it is multi system approach that encompasses the idea that a great deal of illness is driven by our emotional response to the world. It is in fact a wildly individualized approach because it involves recognizing that everyone is going to have a diverse set of reactions to the world based on their own experiences, biology, and learned responses. The second paragraph quoted above, which argues that the pain is a neurological condition because scientists can see pain lighting up in different areas of the pain, negates the fact that the areas that light up in chronic pain are the emotional centers of the brain. In other words this pain might also be described as, the kind of pain which our bodies use to protect us via a complex interaction between brains and nerves. Further we might posit that our brains are trying to protect us from emotional threats because the brain can’t always differentiate between physical and emotional threats- and in fact often reacts to emotional threats in a physical manner. We see this through sweating, blushing, nausea, and headaches she we get nervous. When this happens in a chronic and unconscious way the symptoms can become much more severe. While Dr Sarno may not have understood the exact mechanisms that were causing the pain he clearly understood the process well enough to help people to heal. The article continues by painsplaining the problems with Dr Sarno’s approach. It is true that Dr Sarno wasn’t interested in the findings of MRI’s unless they showed a tumor or a broken bone. However, as Dr Sarno pointed out, when we look at brain imaging and say that the problem is neurological because we can see it on a scan, it doesn’t negate that the reason for the neurological changes isn’t emotional. In fact doctors generally ignore that possibility. As Dr Sarno points out below, in the 19th century, before Freud, mental illness was seen as a “disease of the brain”, but now it’s being called a chemical aberration. He said this before FMRI machines revealed the neurological changes. However, at it’s core- it’s the same idea- the people who view these changes simply can’t visualize that the cause might be emotional. They aren’t even considering that question. Dr Schubiner understands this and credits Dr Sarno with putting him on the right path. However, the quotes chosen by the author frame him as downplaying Dr. Sarno’s contributions. A lot of what I have written above is a repetition of things I’ve written over and over. I was prompted to revisit this piece because when I try to discuss it people tend to throw the baby out with the bathwater rather than engage in thinking about the broader ideas being brought up. In response to this recent article I made a Facebook post about another article in which the author dismisses Gwyneth Paltrow’s Goop website in a similar fashion. Here is what I wrote. “To be sure, Goop has tapped into a real longing out there. Traditional medicine has failed people in many cases, and often lacks solutions for the most common health woes — chronic pain, obesity, Alzheimer’s. You need not look any further than the raging opioid epidemic to find cases where medicine has also done more harm than good. Her writing puts Dr Sarno’s closer to junk science than science. This idea that science (as practiced) isn’t an ideology, or an industry, totally negates that it does function as an industry (the medical industry/pharma)- which has an outsize influence on process. And that process is influenced by an ideology of science that is only valid if it is practiced in the form of randomized control trials. Due to this limiting ideology that ignores information that can’t be understood through randomized control trials- this ideology dismisses any facts that haven’t been “proven in this manner”. The discussion and this framing, is willfully blind to the influence of financial considerations in regards to what questions get asked. It’s kind of mind boggling in the pretense that science is not influenced by ideology or money. Again, I’m not writing in defense of Goop- I don’t really know anything about Goop- what I am responding to is the casual dismissal of questions that haven’t been asked by a system that simply hasn’t bothered to ask them- or put the resources towards answering them. Framing things the way that Belluz does- she simply can’t accept that Dr Sarno’s basic idea that the mind and the body are intimately related – and that we can’t practice medicine properly without taking this into account. She therefore casually dismisses what he has to say because his manner of looking at the issues doesn’t comport with her idea of “science” as an ideology. Several people engaged in a fruitful discussion about the topic. I woke up this morning though to the following response- which prompted me to sit down at the computer and bang out this post. – The burden of proof is on the claimant. Simple assertions with no studies backing them up are worthless, and usually false. – Such claims often fly in the face of what science knows about anatomy and diseases etc. Claims that contradict large bodies of evidence usually are false. – Most such claims fail in common ways: ignoring any discussion of dosage, claiming to cure N unrelated diseases, appealing to emotion or conspiracy theory thinking, claimant is pushing N different miracle cures. Scientists would love to discover some miracle cure for N major diseases, or some amazing new body system such as chi or energy pathways or something. The scientist who did so would win a Nobel Prize. But these wild, money-driven claims are nonsense. While these are useful observations, they don’t directly address the central problems that I brought up in relation to Dr Sarno. His work wasn’t based on “wild, money-driven claims”. While he did “appeal to emotion” in the sense that he asked people to look at, examine, and be with their emotions, he did not traffic in conspiracy theories and didn’t see his work as a miracle cure- but instead common sense. His “claims” did not fly in the face of what we know about anatomy- but instead relied on his understanding of anatomy to point out that the huge leaps- and claims- people were making about what they saw on MRI’s was wrong. Even the Vox article begrudgingly points out that science has proven him correct on this point- and this is not a minor point. If the science shows us that MRI’s don’t give us useful insight on the causal relationship between soft tissue “abnormalities” then we are talking about 100’s of billions of dollars worth or wasted resources and untold amounts of added suffering. Sarno also intuitively understood that anatomical abnormalities like lumbar disc bulges are not actually the source of pain for many people — and called these injuries “normal abnormalities.” Research over the past two decades has piled up to prove him right. For example, when you compare people with the same MRI results showing the same back injury — bulging discs, say, or facet joint arthritis — some may experience terrible chronic pain while others report no pain at all. As Dr Sarno pointed out, he used close careful observation, rather than relying solely on randomized control trials. What is mind boggling is how easily every other scientist ignored their counterfactual observations; things like the “abnormality” on the MRI not lining up with the area of pain. For decades pain specialists asked no questions about what was going on in people’s lives. Now, while they do take a biopsychosocial approach, the focus is still largely on the bio-technical in a way that makes it hard for people like Dr Chou, who is quoted above, to grasp the concept that the neurological change might have to do with a learned emotional response to the world rather than faulty wiring or chemical aberrations. Sometimes we haven’t found a way to prove that something is true because we haven’t been even able to grasp the concept well enough to ask the question. As Dr Sarno points out, we used to know this is true but we’ve forgotten. My friend Christina sent me this article about “The Recovery of the Sacred” when I shared a draft of this post with her. It’s a very different perspective that might help people shift their perspective.